Hillary Clinton and Donald Trump take the stage for their first presidential debate, at Hofstra University on Sept. 26. WOULD YOU HIRE a babysitter who lied with impunity? Would you choose a therapist who was a compulsive braggart? Would you want as your accountant or financial adviser someone who trailed the reek of corruption and bottomless avarice? Would you list your home with a real-estate agent who routinely played fast and loose with rules that others must abide by? Would you attend the church of a pastor who spewed insults and threats and trafficked in delusional conspiracy theories? If so, you'll have no trouble supporting Donald Trump or Hillary Clinton for president. But if you wouldn't entrust your personal affairs to someone manifestly devoid of ethics and good character, how can you think of entrusting the nation's highest office to either of the major-party candidates? 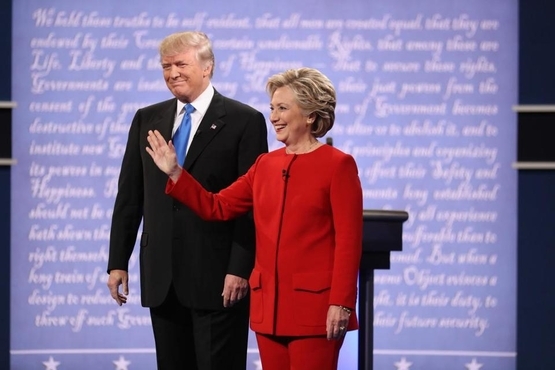 Over and over this year, Trump and Clinton have been described as the two worst presidential nominees in living memory — perhaps the worst matchup in US history. Both candidates espouse bad ideas and destructive policies, but that isn't why they are so widely regarded as appalling choices for the White House. It is the candidates' lack of integrity that makes so many Americans despair when they think of the upcoming election. Opinion polls have consistently reflected Americans' terrible opinion of the nominees' character. In a USA Today/Suffok University poll taken just before Labor Day, 59 percent of likely voters said they don't think Clinton is honest and trustworthy — and that included nearly one-fourth of her own supporters. An even larger majority, 61 percent, don't regard Trump as honest and trustworthy, including one-fifth of his supporters. The public's misgivings about Trump and Clinton are well-founded. To elect either one would be a moral disaster. I plan to cast a ballot for the Libertarian candidate, Gary Johnson. I don't agree with every position Johnson endorses (though I certainly share the libertarian tropism for smaller government, lower taxes, free trade, robust immigration, and individual autonomy). Nor, to be fair, do I disagree with every proposal and priority of the Trump and Clinton campaigns. But I'm not voting for president this year on the basis of traditional issues. I'm basing my vote on character. Johnson's is acceptable — he appears to be honest, friendly, capable of self-criticism, and not egomaniacal. That puts him miles ahead of Trump and Clinton, incorrigibly mendacious self-aggrandizers for whom personal ambition always supersedes ethical standards or the national interest. This isn't to suggest that what the presidential candidates' say about the economy and foreign policy and national defense and criminal justice isn't important. Of course it is, and if this were a typical election I'd be voting for the candidate whose political outlook came closest to my own. Unfortunately, this election isn't typical. The major parties have coughed up nominees so tainted that to vote for either one would amount to a betrayal. Our generation inherited a democratic republic that, despite all its flaws and weaknesses, was grounded in the conviction that a basic level of civic virtue is indispensable to the survival of American freedom. A vote for a candidate as dishonorable as Trump or Clinton is a vote to trash that inheritance. I can't bring myself to do that. The founders of the American system warned at every turn that without moral and civic virtues to navigate by, no democracy can endure. The nature of government is inseparable from human nature. "As there is a degree of depravity in mankind which requires a certain degree of circumspection and distrust, so there are other qualities in human nature which justify a certain portion of esteem and confidence," wrote James Madison at the very end of Federalist No. 55. "Republican government presupposes the existence of these qualities in a higher degree than any other form." In short, if good character and integrity no longer matter, government of the people is doomed. Politicians aren't expected to be saints, and political campaigns aren't church socials. Campaigns get nasty, and promises get broken. Voters are deceived and disappointed by elected officials all the time. But it's one thing to understand, as Senator Ben Sasse of Nebraska has written, that candidates sometimes lie after winning office. "It's another thing entirely to conclude in advance that they are both liars, and simply shrug and elect them anyway. That does something to the national soul that tears at the fabric of who we are." 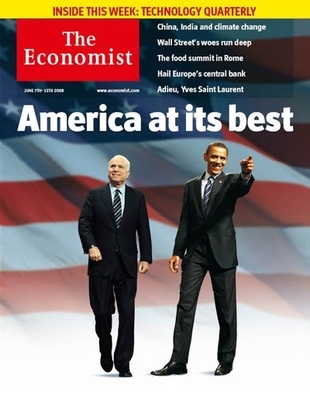 In 2008, The Economist titled a cover story about that year's US presidential contest "America at its best." The article hailed Republican John McCain for his political courage. It applauded the qualities that enabled Democrat Barack Obama to vanquish the Clinton machine and become the first black presidential nominee. "The doughty but sometimes cranky old warrior makes a fine contrast with the inspirational but sometimes vaporous young visionary," the magazine concluded. "This is the most impressive choice America has had for a very long time." Alas, there is nothing remotely impressive about America's choice this year. Obama and McCain both had their shortcomings, but Clinton and Trump are practically defined by their cupidity, deceit, and self-righteousness. For Americans to elevate anyone so reprehensible to the presidency would be to humiliate themselves before the world. It would also be a sign that the great American experiment in republican self-government may have run its course. At the close of the Constitutional Convention of 1787, as Benjamin Franklin was leaving Independence Hall, a woman approached him with a question. "Well, Doctor," she asked, "what have we got — a republic or a monarchy?" Franklin's famous answer: "A republic, if you can keep it." Well, we kept our republic for 225 years. Whether it survives the 45th president of the United States is an open question.